Michael is a Vice President with Smithfield Foods. Smithfield Foods is a vertically integrated operation from production to retail marketing. The company markets 16.8 million pigs annually. Skahill currently serves as an officer and treasurer of the National Pork Board. 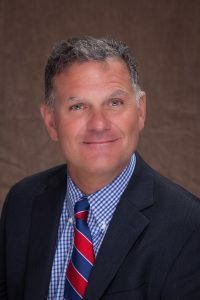 Skahill also is also a member of the National Pork Board’s International Marketing Committee and Chair of the Trade Committee for the North American Meat Institute. Skahill also represents the National Pork Board to the Virginia Pork Producers Association. In addition, Skahill also serves on the board of directors of the United States Congressional Awards and was recently appointed to the board of directors of the International Student House. I believe that there are two major issues facing the pork industry today. First, the threat of a foreign animal disease in the United States. Such an event would be devastating to the entire agriculture industry. Second, continued trade access and trade retaliation by major importing countries of our product. What do you think should be the main goal of the Checkoff and NPB? The main goal is to remain relevant to America’s pork producers. Our objectives should be to educate producers, promote research that enhances the industry and to promote demand for American pork internationally and domestically. As a board member, I need to remain cognizant that I am representing producers when striving to effectively and efficiently allocate Checkoff dollars. I am seeking re-election to serve on the National Pork Board. While we were able to accomplish a lot during my first term, I still believe there is a lot of work to be completed. We have many programs in play such as the Pork industry’s We Care℠ program, Secure Pork Supply, Pork 2040, which is the long term view of international marketing; and the 2020 National Pork Board Future Vision Plan, that will continue to shape to future of the pork industry.